This event not only represents the culmination of over eight years of cooperative effort on the parts of thousands of ISKCON devotees from around the world, but heralds the beginning of a new and exciting phase towards the completion of the TOVP. It is truly another milestone of achievement that we can all be proud of, and we are certain Srila Prabhupada is smiling upon us. The three month marathon being organized by Sadbhuja prabhu in preparation for the Chakra installations continues unabated. 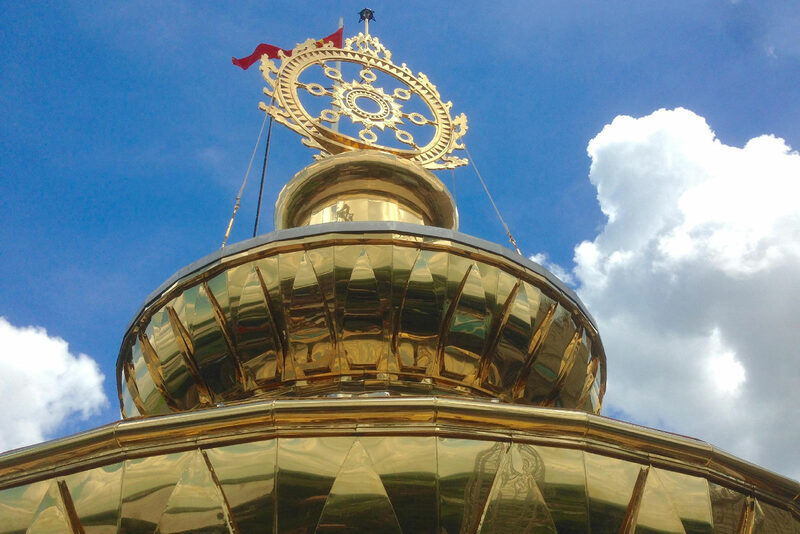 The Nrsimhadeva Dome Kalash is almost complete and the Main Dome Kalash is fast approaching completion. Between the Kalash mounting, painting and fastening the dome ribs and stars, assembling both Chakras and working on the Chatris, all the transcendental sevaites are working around the clock to bring the marathon to its completion by February 7th for the Grand Installation Ceremony of the Chakras onto Sri Sri Radha Madhava’s and Lord Nrsimhadeva’s Domes.